THANK YOU FOR YOUR INTEREST IN THE RADIANT HOT YOGA 200 HOUR TEACHER TRAINING PROGRAMS. Start this New Year by Taking Control Of Your Life. Commit to Yourself, align your Mind, Body, and Soul! Rise to the Challenge, dive deeper into your own personal practice. The Teacher Training Program is a beautiful 8 week journey of self discovery and awakening. Through this journey; you find your truth, discover your voice, find your path, open your heart, awaken your soul, and create life long memories. This a an experience about diving deeper into yourself and your yoga practice. Whether you are looking to deepen your personal yoga practice, break old patterns discover your strengths, or maybe your dream is to inspire others and teach, this teacher training is beneficial for everyone! This will not only awaken you to yoga, but it will awaken you to the best life possible! You will shed things that do not serve you, and gain hidden strengths that you did not know you contained. If you are looking to change your life for the better and to align with your highest purpose than the Radiant Hot Yoga Teacher Training is for you! Start the New Year by taking control of your Life. Commit to you! The Radiant Hot Yoga Teacher Training is a 200 hour Yoga Alliance certification. This Teacher Training not only prepares you how to teach the Radiant sequence, but you will also learn Yin Yoga, Sculpt Yoga and most importantly how to discover your authentic power. We specialize in transforming people into their higher self. We guarantee that a beautiful journey of transformation awaits. You are NEVER too broken, too old, too young, too shattered, too scattered, too hopeless, to Challenge Yourself and Reach New Heights, that you never thought were possible. and Sundays from 8:30 am – 5:00 pm. The teacher training with Radiant Hot Yoga was such a precious and pivotal time in my life. Darlene and her daughters created the most nurturing, encouraging, safe space for me to fully come into myself and my power. I became more in tune with my body and in tune with my soul. I reached deep inside myself and found my voice. I became empowered to live my passion and teach yoga! I truly cherish the community we all built together and the distinct feeling of coming home. This teacher training is a rare and very special one of a kind opportunity to dive into yourself and discover all the beauty and strength that lies within – it has profoundly transformed all areas of my life. I am forever grateful to have been a part of this life-changing experience. I started practicing various styles of yoga 14 years ago and the minute I tried hot yoga, I was in love! I was on and off the fence about further deepening my practice with teacher training and then finally, one day while I was in class, I decided it was my time to rise. I searched for a yoga teacher training program that would work with my schedule, being a full time employee and new mommy. To my surprise, RHY TT had everything and so much more! If any of you are thinking about deepening your practice and becoming a yoga teacher, I would highly recommend Radiant! Darlene is such an inspirational, loving, inclusive, mystical and nurturing leader who cares about every individual that comes through her studio along with her beautiful daughters and staff. There is nothing but love and growth here. If there’s one thing I wish I could have done differently, it would have been going to RHY teacher training sooner! Teacher Training at Radiant Hot Yoga is so much more than I’d ever imagined. I am forever grateful for the love and most amazing experiences that I’ve gained from it. Not only did I feel safe with a loving yoga community; I gained more self-acceptance and learned how to embrace more of my own power within. The short 8 weeks provides an opportunity for a variety of other Yoga concepts and subjects that are not able to be taught in a hot yoga room during practice to be introduced to us. I certainly connected with the description that our yoga instructors often described of Teacher Training, that you would dive deeper into your practice; and that it certainly did. I truly felt that I’ve dived deeper into my practice and ultimately into myself. 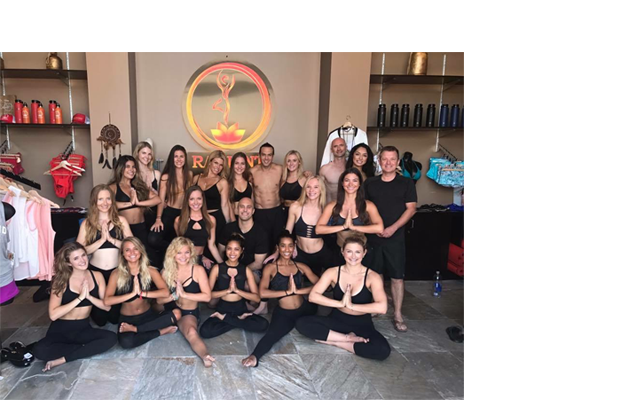 I highly recommend Radiant Hot Yoga Teacher Training program to anyone who’s interested and that you WILL be able to find the time to make it happen. The sooner you commit, the sooner you will see the joy and love of how Teacher Training will impact your life. Keep in mind that the true beauty of Teacher Training can only be felt and experienced and not read on paper. I got started in yoga about 15 years ago taking bikram yoga. After quitting my practice due to addiction issues I did not practice for many years. After being sober for several years I was looking for hobbies and activities to try and stay in shape and hopefully and mental balance and health as well. After trying many different studios and just not finding what I was looking for I found Radiant and really fell in love with practicing, however I never had any thoughts of becoming a teacher. After serious prodding from several teachers who recognized my passion for yoga I took teacher training in the Fall of 2017 and it was truly one of the best 9 weeks of my life! From making new friends, discovering how incredibly rewarding it is to teach and see and feel that difference you are making in students lives and all the in-depth study of the postures, nutrition and meditation was so educational. I started going to Radiant Hot Yoga regularly this year. After completing the 30-Day Challenge in June, I decided to deepen my practice and enroll in the Fall 2016 Radiant Hot Yoga Teacher Training. I cannot express in words how grateful I am to Darlene for inspiring us to be the best versions of ourselves during the intense 8-week training. I met remarkable human beings and was spiritually inspired and guided by Darlene and her two beautiful daughters. We learned so much: to breathe, watched inspirational videos, learned to be grateful and vulnerable, we studied the Chakras, Patanjali’s Eight Limbs, Yogananda, Anatomy and the 8 joints, the Doshas, non-verbal communication, Hindu Gods, nutrition and inspiration. I gained wisdom, peace, knowledge, filled my vessel with goodness not material, a new purpose, enlightenment, and I am starting to loose my ego. But the biggest gift is being open and vulnerable because without vulnerability, you cannot be authentic. I look forward to teaching and both enlightening and empowering others to improve their lives and find happiness. Lastly, I strengthened my body and have improved significantly in all the poses. My body, mind, and spirit are stronger and I am certainly grateful for this gift. I am forever grateful to Darlene for creating Radiant Hot Yoga – a place for growth. 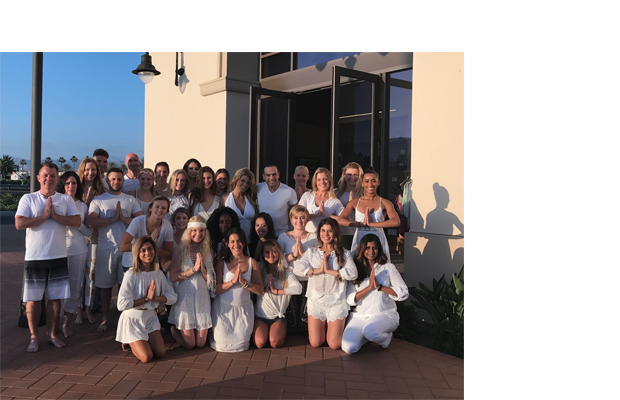 I became a certified yoga instructor and graduated RHY Teacher Training in Spring 2016, it was truly an extraordinary experience, physically, mentally, socially and spiritually. It was an incredible 8-weeks of intense training not only learning so much about yoga and the body but also a deeper understanding of the self. I am so grateful to have been part of the training and created so many memories with new friends that will last forever. I was scared out of my mind to do the teacher training but I can honestly say it was the best decision I have ever made. It challenged me both mentally and physically and it gave me the confidence I needed to teach and to grow in other areas of my life. TT came at a time when I really needed to be inspired, to be pushed to step forward into growth and away from fear and the community, the program, and the experience did just that. It was so much fun and such an incredible experience. I recommend it with my entire heart even if you just want to do it to deepen your practice. You will leave a fantastic teacher whether it is as a teacher of light and of positivity or a yoga teacher. You will become stronger in yourself and in your abilities, I know I did. My journey through yoga has been life changing. I have come to know myself in ways I had not explored before. I have experimented with a certain vulnerability of my soul that I had kept concealed for fear of exposing the parts of me I work to keep hidden. Yoga took away that curtain of doubt because it guided me into the light. Whereas before I perfected a façade of invulnerability, yoga has helped me understand that shattering my walls to let in people is one way to open my heart up to all the beauty of the universe. I found teacher training at a very difficult point in my life, where for the first time, I had experienced uncertainty on multiple levels and could not find some peace. There were many aspects of my life that were vague and unsettled, and I felt the challenges beginning to weigh heavy on mind. Teacher training introduced me to a group of strong-minded, caring, beautiful and inspirational women who offered me insight and kindness. I feel blessed to be a part of such a diverse group of women, who have touched my heart in so many ways. I am grateful to Darlene for her leadership and support, and to the teacher training group for their boundless grace and love. My experience with the RHY 200 hour teacher training was an absolute gift to me in my life. I almost didn’t sign up to do it because I was not sure that I had it in me to actually teach. But with loving encouragement from some beautiful teachers that were already teaching at this studio and Darlene, I took a leap of faith and signed up. The experience challenged me, pushed me to the limit in the best way possible, and gave me beautiful growth as a person in so many ways. I feel so fortunate to have found this particular teacher trading program at Radiant Hot Yoga. Darlene, (the owner of RHY) put her heart and soul into our training and helping us become the very best that we can. She has a true love and concern for her teachers in Training. We had so many unique and different teachers come to our training to teach us so many different aspects of yoga. It took my practice to a much deeper level. It really opened my eyes to all of the amazing areas of yoga that can be explored. From Kundalini, Ashtanga, Gongs, Chanting and meditation, deepening my knowledge of the asanas (postures) that are practiced in yoga, as well as learning about Chinese medicine, health through food, and the Study of the bones and muscles of the body. I loved soaking in all of the new things I was learning! Some of my favorite moments in training were when we would first arrive in the morning, sit in a circle, and Darlene would show us a very uplifting video or we would do breathing exercises to start the day. I would feel overwhelmed with gratitude in those moments for the experiences I was having there! All of these things were wonderful, but most of all for me, I had the desire to teach. And I didn’t have the confidence to do it at first. When training was over, and after I had taken my first class from Childs pose all the way through to savasana, tears filled my eyes. I have come so far, and I did it! I am so thankful to have had Darlene as a mentor in learning to teach. She is an amazing woman! And I would never be where I am if I didn’t sign up for the teacher training! Thank you so much Darlene for helping put me on this beautiful path to teaching through your amazing teacher training program! It is an experience I will never forget! Which Teacher Training Edition are you interested in? It would be my greatest joy to share this experience with you. If you are in search of healing, of change, and of more peace… I can promise you that Teacher Training is a blueprint for a happy, healthy and spiritual life. We have to step out of our comfort zone, and be willing to be courageous for that change to occur. Be prepared to physically challenge your body, expand your consciousness, make friends for life, and find playfulness in your yoga practice. I look forward to walking along side of you during this journey into the deepest parts of yourself. I came into Teacher Training to solely learn the mechanics of yoga postures and how to run a yoga class, in order to teach yoga and its physical benefits. But, what I did not know was that I was about to go on the biggest self help journey I have taken in my life. I came to Radiant Hot Yoga Teacher Training physically weakened from treatment of a life changing medical diagnosis. I felt that the teacher training would be a great way to build myself back up physically, it did. The Yoga training gave me tremendous physical strength and when completed I had felt stronger, physically, than I ever did before. However, due to my medical diagnosis I came to Radiant Teacher Training mentally fragile, scared, and confused on what I wanted to due next with my life post diagnosis. The spiritual, meditational, and motivational exercises gave me emotional strength. I was no longer scared and confused; I came away from the teacher-training program with mental and emotional strength, clarity and sight with a clear vision on what I wanted to do the rest of my life, both professionally and in my personal life. I had always had these visions, however, I had kept them inside hiding. The lessons learned in Teacher Training brought those visions out and helped me become the person I always wanted to be deep down inside. The Teacher Training experience is truly priceless and there is no amount of gold I can ever repay Radiant Hot Yoga and the Dearen family, my treasure to them is my respect and love. Teacher Training has completely changed my life! I completed my 9-week Training in the Spring of 2017. From week one, we embarked on a such a beautiful journey, spiritually, mentally, emotionally and physically. Darlene, Skyler and Savanna fully dedicate themselves to these 9-weeks, always providing unconditional love, support, and guidance. Not only will you become more connected with your yoga practice, but more connected with yourself and everything around you. This has truly been the best gift I have ever received, I am so grateful! The 9-weeks go by so fast and at the end, you will definitely be wanting 9 more! I would do Teacher Training over and over again and highly recommend it to everyone! The connections I have made, the growth I have experienced, and the peace and love that has filled my heart and body from inside, out has been magical and life changing! Thank you to all my fellow TT’s and the beautiful Dearen’s for walking this beautiful path with me! Teacher training at Radiant Hot Yoga has truly been a life changing experience. Darlene, Skyler and Savanna, the owners of Radiant, are truly your guides to helping you dive deeper into your spiritual and physical practice, and showing you the importance of being a teacher. You will learn the history of yoga, different types of meditation, nutrition, how to achieve what you want out of life, and so much more! The nine weeks flew by, and by the end you can’t wait to start your new journey with Yoga. The first chapter of your book starts here. Sign up now for the Teacher Training, and the first chapter in your book will be about Challenging Yourself and Reaching New Heights, that you never thought were possible.